I'm trying to define custom events. Currently I'm working with TZoneDigitalAVL05 and TZoneDigitalAVL02. 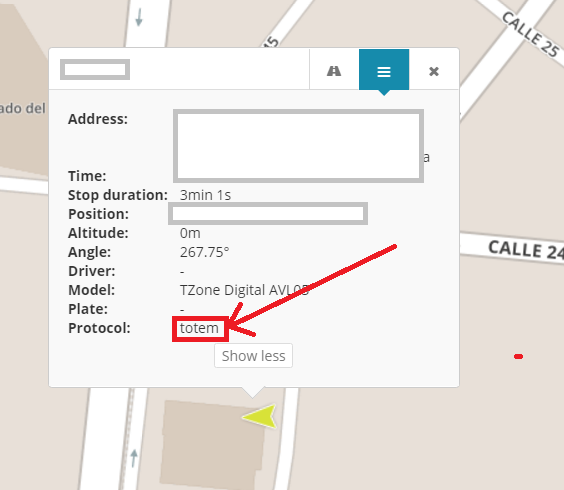 The issue is when I try to see the protocol used by the device, it shows "totem" (screenshot attached). Why do TZone AVL05 and TZone AVL02 are using this totem protocol? Although both gprs protocols are almost the same $$<length> ... <checksum> the paramaters in "History"->"Log data" are just some paramaters of the total sent by TZONE's devices. Using totem protocol can cause erratic data in Event, io, adc, battery and other fields. How could I set up the devices in order they work with tzone protocol? this is just a name of the protocol in internal system, it works fine with tzone devices, if you have any issues with the protocol decoder, please write to support@gpswox.com to fix it. yeah, basically it works fiine and the parameters look good in History->DataLog section, but the alarm types of the data package sent by the devices to server don't have the same code. As it can be seen in the two lists bellow, only SOS alarm match in both protocols, for the others is a different code. Why is this important? If this alarms would be sent correctly, we could create events and alrets in GPSWOX much more directly. It would be really great if the system could difference between this two protocols. Other alarm event can be customized upon the detailed needs. I just took into account.... another issue here is the gprs messages , they dont work in the same way in these two devices. And I suppose that the Acknowledge response are managed in different ways too. Please send HEX sample of each column you mentioned, protocol documentation to support@gpswox.com so we will update protocol decoder. Regarding gprs message please do the same.